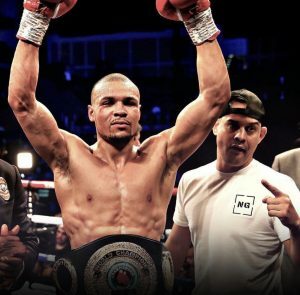 What’s Next For Chris Eubank Junior? Chris Eubank Jr. (28-2, 21 KOs) got the biggest win of his career this past weekend when he knocked down former champion James DeGale (25-3-1, 15 KOs) twice and thoroughly dominated the contest. For Eubank Jr it was a win that he desperately needed. The story around him was that he looks like a world beater when he faces lesser opponents but when he steps up his level of competition he has failed. It’s hard to argue against it as Eubank Jr had lost his two biggest fights of his career in George Groves and Billy Joe Saunders. Many had already written off his chances at winning. DeGale after all had the experience and pedigree advantages. Eubank Jr made a huge statement by putting on a dominant performance. Sure he picked up the IBO Super Middleweight title in the process but most importantly he proved that he can indeed raise his game when need be. So where exactly does he go from here? Is he one of the best in the division? It’s hard to say. Was DeGale a shot fighter? It sure seemed like it. Regardless if he was or wasn’t Eubank Jr now has a signature win under his belt and a long list of fighters that he can take on next. Let’s take a look at who exactly that should be. Over on the other side of the world Anthony Dirrell captured the WBC Super Middleweight title for the second time in his career with a win over Avni Yildirim this past weekend. It was a contest that was very close and had to be stopped in the tenth round due to a massive cut over the left eye of Dirrell due to a headbutt. That cut lead to the premature stoppage of the fight with Dirrell taking home the close victory. While Dirrell fought a back and forth affair with Yildirim, Eubank Jr dominated him when they matched up in 2017 to the tune of a third round knockout. The IBO title that Eubank Jr now possesses is not viewed as a major title. The WBC belt however is one of if not the most prestigious in all of boxing. If Eubank Jr can win against someone the caliber of Dirrell and snag the WBC title in the process then that would be a major statement. The former Middleweight champion Billy Joe Saunders (27-0, 13 KOs) has decided to move up to the Super Middleweight division for his next contest to take on Shefat Isufi for the vacant WBO title. If Saunders comes out on top in that matchup as many expect than a rematch with his domestic rival Eubank Jr who he out pointed in 2014 would be must see television. Since their first matchup Saunders has gone on to become one of the best boxers in the entire sport. His attitude might rub the boxing community the wrong way but his skill is undeniable. In a rematch Saunders would be the odds on favorite. With that being said however, Eubank Jr has proved that he has matured and can cause anyone issues in the ring. These two don’t like each other which only adds fuel to their rivalry. Let’s hope we get this rematch sooner rather than later. Callum Smith (25-0, 18 KOs) cemented himself as arguably the best in the Super Middleweight when he lifted the Muhammad Ali trophy by defeating George Groves in the finals of the World Boxing Super Series. Smith has the boxing ability and power that can see him rule over the division for quite some time. Eubank Jr however would beg to differ as he feels as though he is the best that the division has to offer. Did I mention that both Smith and Eubank Jr are both from the United Kingdom which makes this matchup even more intriguing. Eubank Jr wants to be known as the best Super Middleweight in the world but in order to prove that he will need to defeat Callum Smith.